More Than 1,000 Palestinians In Israeli Prisons Go On Hunger Strike : The Two-Way Imprisoned Palestinians are staging a mass open-ended hunger strike to protest their conditions. It's being led by prominent Palestinian political figure Marwan Barghouti. Protesters hold up portraits of Palestinians detained in Israeli jails during a demonstration in Gaza City to show support to the prisoners who launched a hunger strike on Monday. Palestinian prisoners and detainees are staging a mass open-ended hunger strike to protest their conditions in Israeli prisons. Israeli authorities say approximately 1,100 of them are participating in the strike in eight prisons, NPR's Daniel Estrin in Tel Aviv reports, of the approximately 6,200 Palestinians held in Israeli prisons. "It's being led by Marwan Barghouti, a key Palestinian political figure found guilty of directing deadly attacks on Israelis," Daniel adds. "The prisoners are demanding improved conditions like regular family visits, improved medical care, and an end to the practice of holding hundreds of detainees without charge." Barghouti explained the reasons for the collective strike in an op-ed in The New York Times. "Having spent the last 15 years in an Israeli prison, I have been both a witness to and a victim of Israel's illegal system of mass arbitrary arrests and ill-treatment of Palestinian prisoners," he wrote. "After exhausting all other options, I decided there was no choice but to resist these abuses by going on a hunger strike." 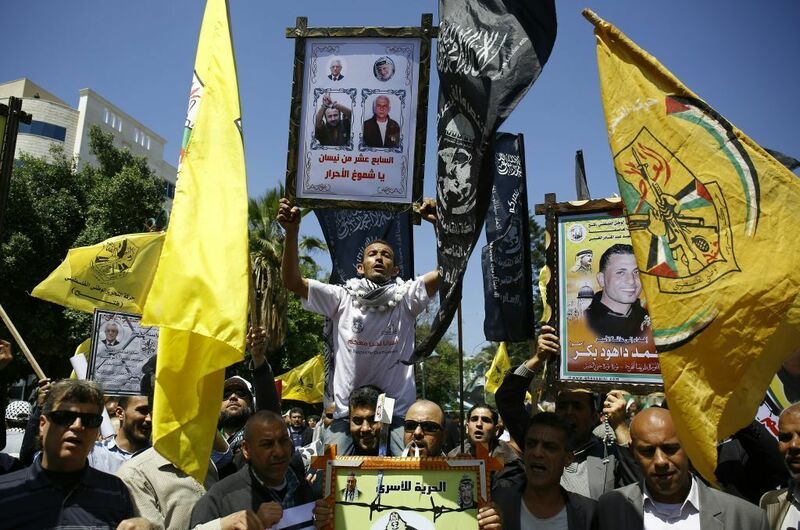 Barghouti is a prominent member of the Fatah movement, though the Palestinian news wire Ma'an reports that imprisoned Palestinians associated with other movements are also taking part. They have reportedly "purged all food products from their cells and shaved their heads," the wire service adds. Activists in the al-Duheisha refugee camp also "shaved their heads in solidarity with the hunger strikers, while a rally took place Sunday marking prisoners' day in the nearby Aida refugee camp," Ma'an reports. In recent years, previous Palestinian hunger strikers in Israeli custody have come close to death and had to be hospitalized. Their plight raised tensions between the Palestinian public and Israeli authorities. The Israeli Prison Service issued a statement threatening disciplinary measures for hunger striking. "Prisoners who decide to [hunger] strike will face serious consequences," the Prison Service said in a statement, as quoted by the Israeli newspaper Haaretz. "Strikes and protests are illegal activities and will face unwavering penalization."